It’s not easy to find an uncrowded market within the App Store – with over a million apps to choose from, you’re likely to come across more than a handful of apps all claiming to do the same thing. 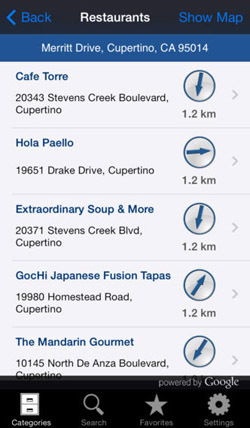 Similarly, a locator app like Places Around has a lot to offer, but sits shoulder to shoulder with a number of other options vying for your attention. In cases like this, with multiple locator apps with near indistinguishable feature sets, we have to consider the ease of use, design, and any possible stand-out aspects to make us choose one over the other. Had it existed on its own without competition, Places Around would surely be an instant hit. Neoappz does just about everything that you would ask for from a proximity service locator, and makes very few noticeable mistakes along the way. 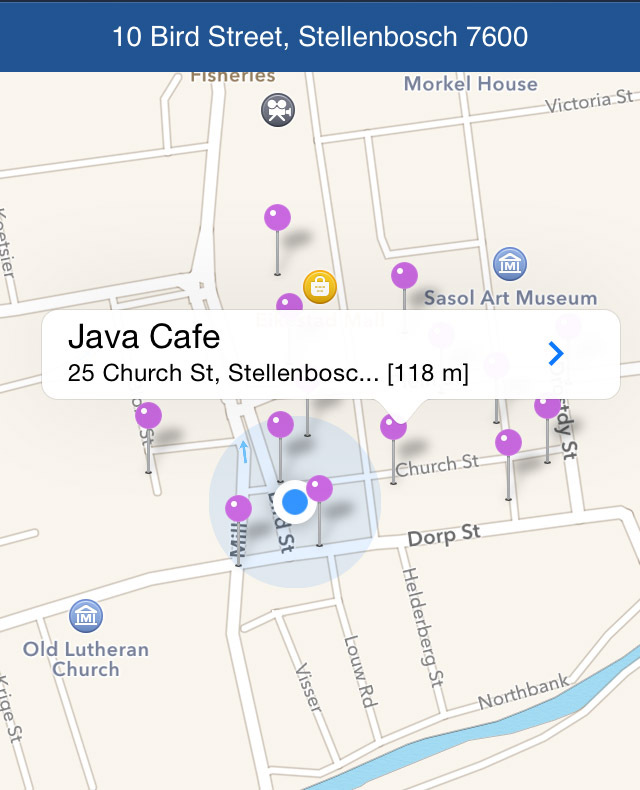 The app detects your location, and then gives you a hefty list of search categories to sift through in your area, populating the map with pins which include contact details, directions, even images via Foursquare. With listings of countless coffee shops, hotels, police stations and so on, finding the service you’re looking for couldn’t be easier. A convenient feature is that you’re not restricted to your immediate surroundings, as you can set your search location anywhere in the world – perfect when planning a trip. 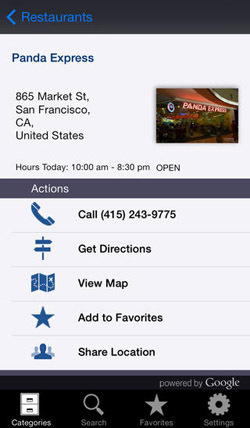 It’s also useful that search listings often include mini-reviews from Foursquare users, and website links which open the site within the app. If you’re feeling overwhelmed by the map screen strewn with little pins, you can view all the listings in a tidy list format instead. In this mode you’re also shown a tiny compass showing the direction and distance to your target, but accuracy here isn’t always great. So far Neoappz has done well. We’ve established that, from a functionality point of view, Places Around does exactly what we expect it to do. Visually it’s a little bland and isn’t going to win any design awards, but everything is clearly labelled and inoffensive, even if the icons are a little outdated. The key problem with this app, however, is that it does not exist in a vacuum, free of competition. Instead it’s just one of many kindred apps which offer the same user experience. Some of the competition handles certain aspects better than Places Around – AroundMe, for example, does just about the same thing but with a more stylish interface and one or two minor feature tweaks. And it’s free. Where does that leave Places Around, with its $1.99 cover charge? Well, as we’ve discovered, there’s nothing really wrong with the app itself, and if you don’t mind the asking price then you’ll be buying a very capable app which doesn’t bother you with advertisements whereas AroundMe is ad supported. It’s worth noting that Neoappz has announced that Places Around will be available free of charge for three days, starting on 16 August 2014, to coincide with the latest version release, so if you can catch it during that timeframe it’s definitely worth a look. After that, it really boils down to your willingness to part with your cash in an instance where equally functional options are available for free elsewhere. 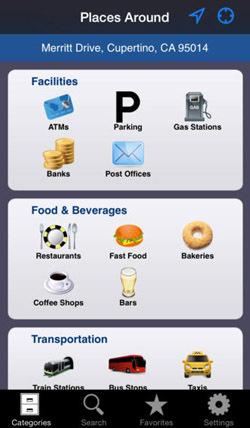 Places Around requires iOS 4.3 or later. Compatible with iPhone, iPad, and iPod touch. This app is optimized for iPhone 5.